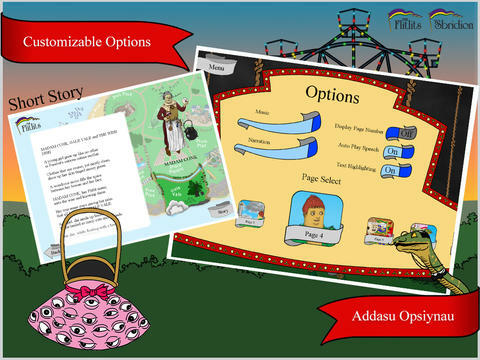 Fabulously surreal and lyrical app that will engage kids, teachers, parents and grandparents. This is an app that has been made with love and care. The app deserves an EAS Certification of 5 Stars and subsequently receives EAS Recommended Status. The team behind this app have really taken a lot of care to create something that is magical and original. As we poured though the app, we were fascinated by the level of lyricism in the language, the depth of the characters and the dimensions of the story. As a reader, you are drawn into a magical world with curious characters and happenings. It is the perfect story to read together as a family or as a special treat in the classroom. There are many opportunities where you can stop the app and discuss the story or talk about the different characters. Older children and adults will appreciate the variety of vocabulary and how the usage of words has additional meanings that provide further depth to the story. The app is extremely functional and easy to use so learners can be left alone to read if you wish. The app is split into two. The first section talks about the land of Fussbut, Seldom See, about the variety of Flitlit characters; their personalities and backgrounds as well as information about the key landmarks that feature in the story. The second section is the actual story that readers scroll through in order to improve their literacy, concentration and communication skills. 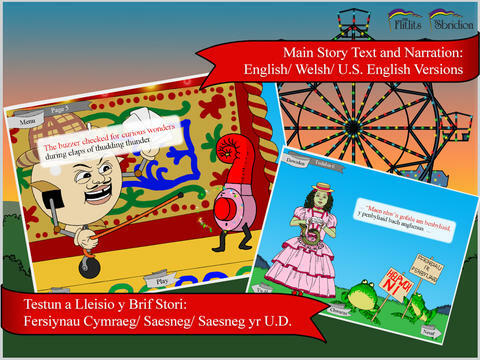 The app is laid out so that you have the option of having the app read to you with timed highlights on the words so that readers can follow the story easily and learn new vocabulary. Another option is to have these two features turned off so that children can practice by themselves. The combination of simple design, artistic illustration and functionality make the app simple and effective. It helps to develop memory skills, to maintain attention and concentration and to develop auditory and visual processing. 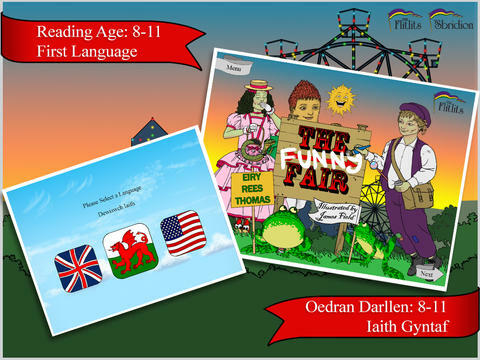 Readers can use the app in Welsh as well as English and teachers and parents will be very pleased to know that they can choose between British English and American English (a real plus)! 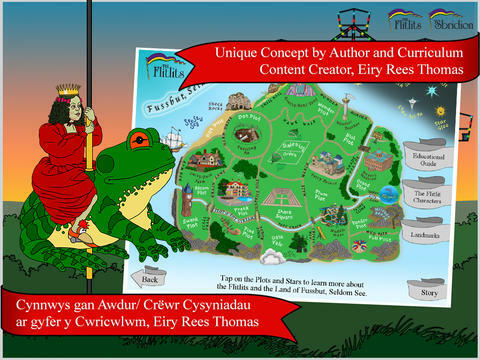 This is the first story in the series about the Flitlits and both children and parents will fall in love with the characters. 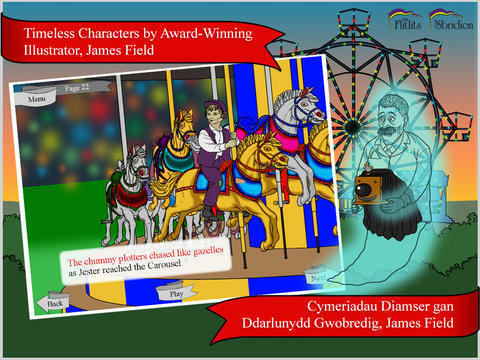 The characters have very well developed personalities so that kids can develop their own emotional intelligence too. This is a super app and perfect for encouraging bed-time reading. Enjoy! The central character, JESTER BIT, is a scamp with a heart. His mischief leads to compassion, empathy, team work and a sense of fair play. Readers are invited to look behind the stories, the habitat, the interplay between the characters and more. This hilarious story finds Jester Bit scheming and dreaming. Will Jester's cunning twiddle stick lead him to, or help him out of trouble? What prompts his friend, Ozzie Mo, to swell after feeling out of shape at a Hall of Crazy Mirrors? Three friends craft a cunning plan.